With the Juvenile Authority and vindictive parts pirates hunting them, the paths of Connor, Lev, Cam, and Risa will converge explosively;and everyone will be changed. 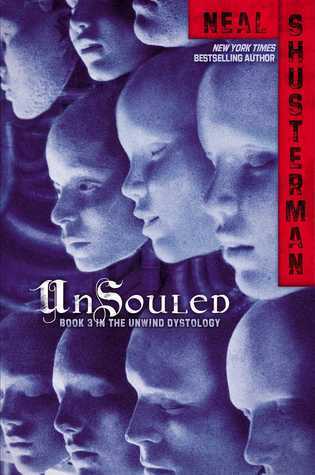 This has signature Shusterman deep, thought-provoking moral dilemmas. I love that he mixes in with his story (which at times, can seem incredulous), real clips from articles that make you realize just how realistic the story can be. There are situations and difficulties that the characters face that seem impossible. The kids are making impossible choices with really horrible situations that they experience. I'm quite glad I read the short story Unstrung before this one, because I would have been rather confused if I hadn't. There were a lot of details and some characters that I'd forgotten from the previous books (it's been a long time since I read them), but I didn't think I got too lost. Compelling story and world-building. I'm interested to see where the next book leads us. This book was quite difficult for me to read. Even though I mentioned all the really thoughtful things, it suffered from lack of plot to me. It seemed like they went nowhere, did nothing, and spent a lot of time worrying and wondering and trying to figure out what they should do. I mean, this book is like 1000 pages long, so that is a lot of time to spend thinking on page. It honestly felt like a filler book, which considering it's book 3 seemed rather unfortunate. I'm still invested in the story, because I'd like to see how Shusterman can possibly end this series and not make the world just fall apart. But, I didn't much care for this book. Interesting. I just finished both UNWHOLLY and UNDIVIDED and enjoyed them both. There's always plenty of action in these books to keep my attention. Too bad you weren't satisfied with this one -- I'm guessing you'll like UNDIVIDED better.